The tower on the south end of the building houses chimes that used to regularly play, and could be heard throughout the area. The chimes were not playing the days of my visits owing to work being done on the tower roof. To the north and east of the tower is the charming Chapel, with its Gothic arched stained-glass windows and high vaulted ceiling with exposed trusses. The space is very open and light, and the slate floors complete the classy look of the space. Opposite the entry area, the chancel area of the chapel has two stained glass windows, both traditional depictions of Jesus Christ - one as "The Good Shepherd" and the other illustrating the verse "Behold, I stand at the door and knock." In the back corner of the chancel is a doorway which presently leads to a rear exit to the building. 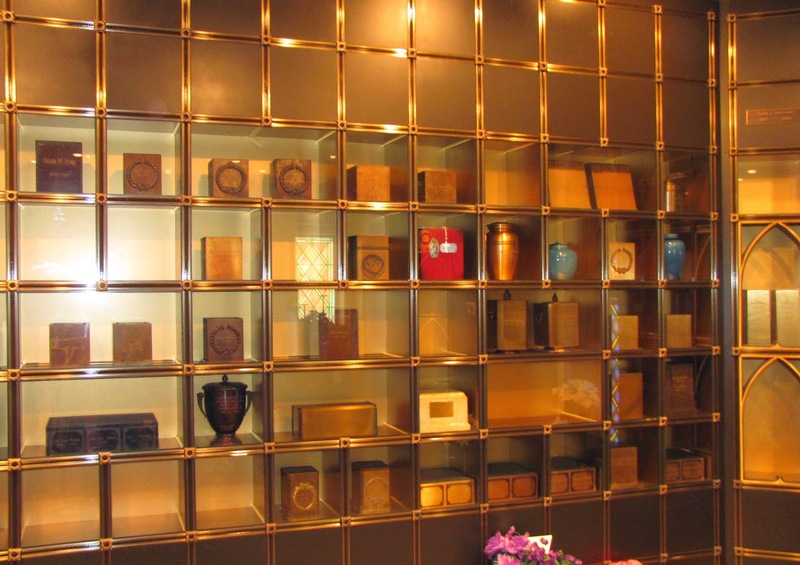 The hallway also opens to a combination control room and storage room, a family lounge, and the columbarium. 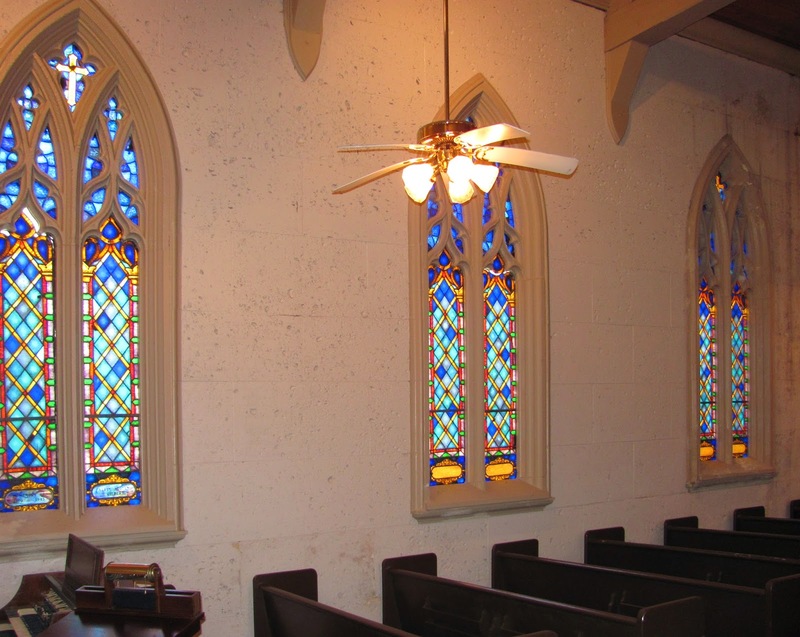 The significance of the chapel, and the reasoning for its feature on this site, is the fact that this space formerly housed the Brookside Crematory which was constructed in 1943 and put to use in 1944. The cremation vault once stood where the family room and columbarium are now, and its chimney can still be seen at the rear of the building. The niches in the columbarium are constructed of bronze and there are feature niches with Gothic arches in the corners and in various other places - the shapes of their frames mimic the arches of the windows in the chapel and the window around which they are constructed. Along the left (west) side of the columbarium room, the niches house a number of historic urns - the oldest I found dating to 1946, and varying in style and makers - from Gorham and Meierjohan-Wengler bronze to MacKenzie cultured marble. There are even a couple of the Rookwood Pottery urns that I have only seen in the Hillside Chapel in Cincinnati. I am unsure of when the crematory vault was removed from the building, but the cremation facility is currently housed in a building several hundred yards to the south of the Chapel of Chimes. I seem to recall visiting the Chapel of Chimes in my teenage years on a wild-hair trip to Houston. The building stood out in my mind, though for many years I did not remember that it was indeed Brookside that I had visited. It is quite possible that, when I visited all those years ago, that the cremation vault was still in place. Little did I know that years later, I would be back on an errand to visit the historic crematories in Texas. 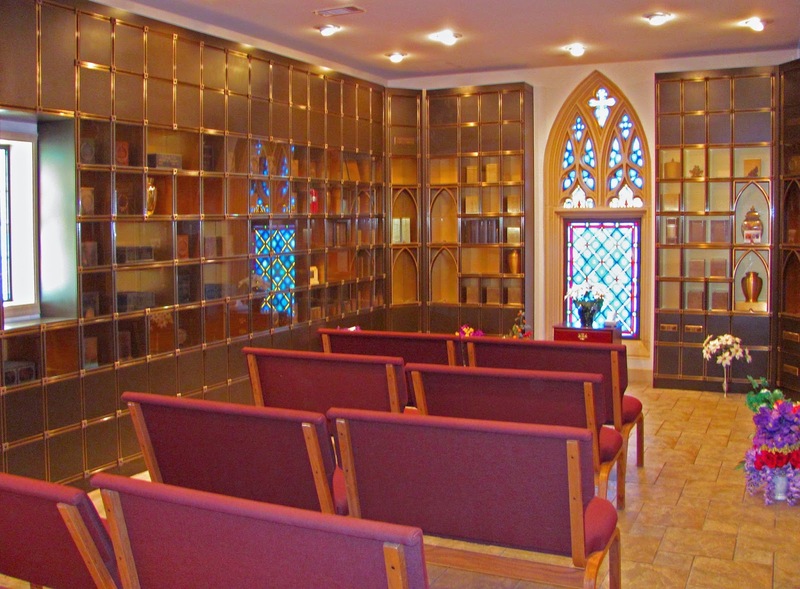 In that way, Brookside Chapel of Chimes was the first historic crematory I ever visited - even if it was unknowingly. It seems that life comes full circle.